Gabon's government announced that it has "dismantled" an elephant poaching ring responsible for smuggling six tons of ivory out of the country in 2017. Gabon is the home of forest elephants that are rapidly disappearing from central Africa. In one Gabon park alone, the population has dropped 80% according to a recent US university study. A Chadian who headed the ring, Abdoulaye Ibrahim, was arrested after a two year investigation assisted by INTERPOL and French law enforcement. The ring's finance man was arrested three weeks later. They face ten years imprisonment if convicted of organized crime. Gabon has deployed its military in some areas to protect its remaining elephant residents. The tragedy of elephant extirpation continues in nearby countries, however. The Central African Republic, wracked by years of civil war, has lost almost all of its elephants (Loxodonta africana) in the northern areas of the country, once an elephant stronghold. (Bamingui-Bangoran NP). 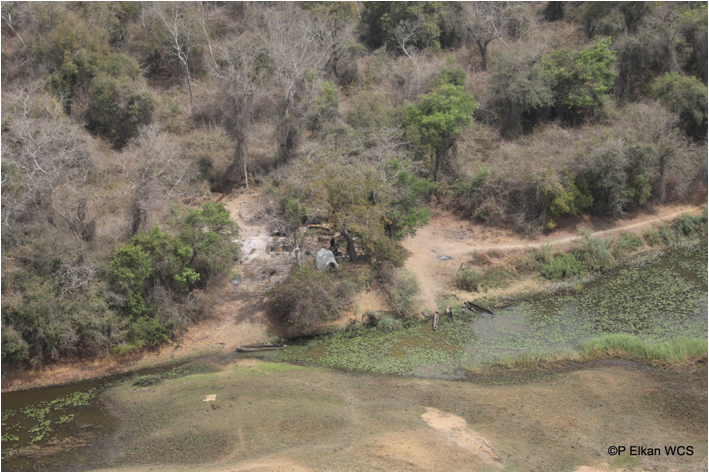 The Central African Republic, wracked by years of civil war, has lost almost all of its elephants A recent aerial survey found a few remaining survivors (68). Those may also be dead by now. The planes covered 63,657 square kilometers (24,578 square miles) across several national parks and their outskirts. The eventual extinction of wildlife in the region can be halted with concerted enforcement efforts, including the deployment of military units with the authority to engage poachers discovered in the field. [photo] Now that most elephants have been extirpated, poachers are preying on other species for bush meat. Cattle herders have invaded the parks, and sell the dried meat to villagers as a sort of bonus income. The government currently controls only about 10% of the nation's territory. Consequently conservation efforts have been severely curtailed. The South African based NGO, African Parks, has taken control of Chinko National Park in the southeast and is succeeding in re-establishing control there.